This Faith Argentina gown from Donna Flora is one of the most stunning gowns I’ve seen in a long time! I use to buy gowns a lot, back when there were only flexi gowns to choose from, but since the introduction of sculpts, and now mesh, I favor casual clothing more. Still, I couldn’t help but really want to wear this dress when I came across it on Donna Flora’s Flickr stream. The gown, as seen here, is a gorgeous White, Blue & Gold color. I was surprised to see that it is not mesh, but just a sculpted attachment (without flexi). 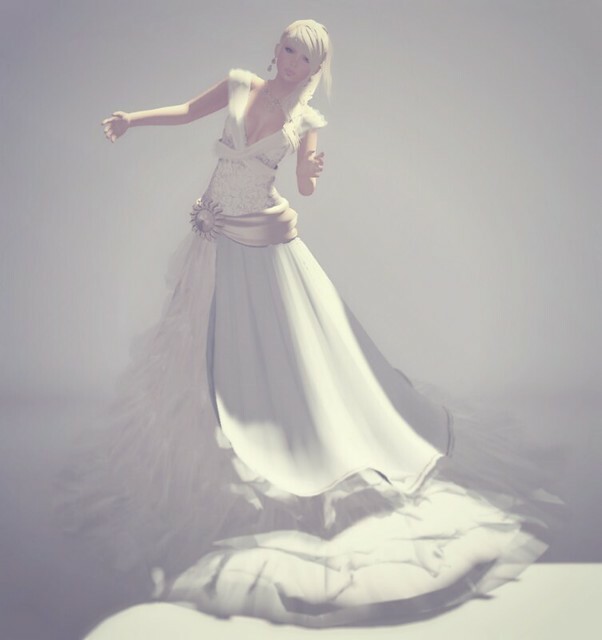 My friend asked me if I could take this gown out dancing, and I think not (it will not move fluidly) but of course, that doesn’t stop anyone on the grid! Also, if you’re a fan of Donna Flora, there is a 70% off sale of some soon-to-be retired jewelry! Do check it out! Some of my favorite pieces are up on that wall! You won’t be able to purchase them once they’ve been retired. that picture is flawless, gogo. so so pretty! they should use your picture for the ad. you make the dress look ethereal.